I think the Honda Freed Hybrid is the best mini MPV in its class. Why? -The exterior design is clean and fuss-free unlike the ugly Toyota Sienta. -The interior design is well laid out and has a zen-like quality to it. It is more spacious than the Sienta inside as well. Honda always knows how to create a practical and spacious interior which its competitors just can't emulate. - The 1.5L Earth Dreams engine paired with the Electric Motor gives this car a very decent acceleration from standstill which can surprise other road users. Together with the dual clutch transmission, the whole driving experience is better than expected from a 1.5L Hybrid car. - Typical Honda build quality means a very well built and solid car which can outlast the COE. Only complaint that it is everywhere now thanks to PHV scheme and the engine can feel slightly sluggish above 100km/h. Been driving Cat B Cars ( 2.4L above) for more then 15yrs, my previous car was 2008 vellfire. As i hardly use up the full space of the large MPV and every time when go for indoor parking, i need to look out the ceiling high too. - sienta, space and car response when overtaking with full load 7ppl. Not quite acceptable. - esquire and Noah - Above $130k selling price, and outlook not as stylish, feeling quite stiff and heavy on car response . - Voxy, price slightly below 130k, basic model can even go below $120. Space and Feeling quite good to drive, the only issue is the seating ratio is 2.2.3 , i need 2.3.2 . - Wish, Are the better choice, price 10k more then Freed, space quite the same as freed, but car responses is better then freed. * At the end, need to compromise between price and power. So i decided on FREED HYBRID. Over all for Freed, i prefer the hybrid model due to the gear knob, Custa LCD info, parking button ( Not foot brake, given u some space on foot) and engine more silence. Usually hybrid and non- hybrid car in market are 20k-30k difference. But now, with Gov grant its less then 8k difference. I strongly recommend this model for your consideration ( Honda Freed hybrid ). 1) Comfort - for that size and price range, i feel it is a value buy and comfort interior. not as stiff as some MPV. 2) Reliability - 1.5L and honda brand, not worry about high maintenance after 5yr. Battery not a big issue, if you do some study and research on hybrid. look at today number of hybrid car in singapore. u will get what i mean. 3) Handling - 1.5L wont expect to have sport car response , but it gave me quite a similar car response compare some Cat B car. 4) Exterior styling - not as sporty , but i like the decent look, not stiff look. 5) Interior design - i prefer the hybrid model due to the gear knob, Custa LCD info, parking button ( Not foot brake, given u some space on foot). 6) Features - With that price, wont expect to have vellfire features, but acceptable price and range. 8) Engine performance - Quite acceptable for that price and 1.5L range. some 1.5L car are way under power. 1) Only P.I carry it. AD did not bring in , Kah motor should consider this MPV on pipe line. 2) Sensing model maybe kind of useless here ( My personal view). i wont pay more for something i don't it . 3) Too many package / model in market , i only recommend ( Honda freed hybrid ) not the sensing model. Was actually looking for Sienta hybrid as I did not know about Freed Hybrid in the first place. 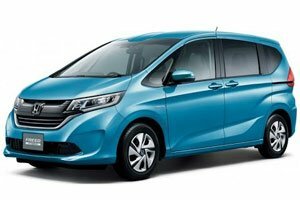 Upon visiting a few dealers then come to know about this compact MPV. With no local reviews on this car, I can only based on reviews on some other Honda models with i-vtec and i-dcd. No comments on fuel comsumption yet as i only did my first 1000km servicing. Before this was only about 16km/l with 20% Highway. After owning the car for 2 weeks, I dare say I do not regret my decision with the Honda Freed Hybrid. 9. 2nd row seats are built 2+1 instead of 1.5+1.5. This does not affect middle passenger to sit "half assed" when the 2 movable seats are not aligned. Authorised Distributor Honda cars are Honda City Reviews, Honda Civic Reviews, Honda Civic Type-R Reviews, Honda CR-V Reviews, Honda HR-V Reviews, Honda Jazz Reviews, Honda NSX Hybrid Reviews, Honda Odyssey Reviews. Parallel Imported Honda cars are Honda Civic Hatchback Reviews, Honda Civic Type-R Reviews, Honda Fit Reviews, Honda Fit Hybrid Reviews, Honda Fit Hybrid Speedo Motoring Edition Reviews, Honda Fit Speedo Motoring Edition Reviews, Honda Fit Trust Motoring Edition Reviews, Honda Freed Reviews, Honda Freed Hybrid Reviews, Honda Grace Hybrid Reviews, Honda Odyssey Reviews, Honda Odyssey Hybrid Reviews, Honda Shuttle Reviews, Honda Shuttle Hybrid Reviews, Honda Shuttle Hybrid Speedo Motoring Edition Reviews, Honda Shuttle Trust Motoring Edition Reviews, Honda Stepwagon Reviews, Honda Stepwagon Hybrid Reviews, Honda Vezel Reviews, Honda Vezel Hybrid Reviews, Honda Vezel Trust Motoring Edition Reviews. sgCarMart is the number one car site for buying Singapore cars, including new cars, parallel import cars, Toyota, Honda, Nissan, Volkswagen, Mitsubishi & BMW. We have new car dealers comprising parallel importers, authorised car distributors, and used car dealers who have the New Honda Freed Hybrid Trust Motoring Edition latest price Find new car pricelists, new car launches, new car promotions, new car reviews, latest car news & car articles. Read the New.Honda Freed Hybrid Trust Motoring Edition consumer reviews to help you decide on buying a car. Also join our car discussion and forum discussion for car reviews, motoring news & motoring guides. Visit our partner sites who have job openings for Singapore jobs, Singapore classifieds, mover and real estate properties for sale.